The computational capabilities of a nervous system are a function of its wiring diagram and the properties of its components, the neurons and glia. Inquires into nervous system function rely on sparsely known or assumed connectivity between neurons or brain areas. Existing circuitry maps detail the connections between very small ensembles of neurons, ranging from pairs to hundreds. This, in contrast with the magnitude of the nervous system of even small model organisms like the fruit fly Drosophila or the zebrafish larva, with over 100,000 neurons. Understanding the nervous system requires far larger wiring diagrams than what we have now, ideally of complete organisms for which experimental manipulation and monitoring of known neural circuits in the context of behavior is feasible. To make headway into the basics of neural circuit function, we propose to focus on small organisms for which (1) the complete wiring diagram can be obtained within a grant funding period; (2) the complete neural activity over time can be imaged with GCaMP in free or fictive behaviors; (3) each neuron can be genetically manipulated independently and reproducibly; (4) the electrical activity of individual neurons can be recorded with electrophysiology; and (5) high-throughput behavioral assays are routine. Today and in the near future, only in the larva of Drosophila are all five experimental approaches feasible. Techniques developed for the larva may soon scale to the adult Drosophila, opening the possibility of applying the five approaches outlined above to limb-based locomotion and active flight, as well as to complex behaviors like courtship and learning. We reconstruct neural wiring diagrams from electron microscopy (EM). We apply graph-theoretic analysis to EM-reconstructed circuitry. We investigate with electrophysiology the properties of individual neurons that participate of EM-reconstructed circuits. We develop the software CATMAID for the collaborative reconstruction of neural circuits. We develop novel methods for semi-automatic reconstruction of neurons and circuits, based on computer vision and machine learning techniques. Starting in December 2012, we are open to proposals from any lab around the world for the reconstruction of their specific area or neuron type of expertise in the Drosophila larval central nervous system (CNS). The ongoing collaborative effort aims at the reconstruction of the complete wiring diagram of the larval CNS. The estimated 10,000 neurons and 3 million synapses will demand the dedication of 50 man-years of work at current rates (we are working towards speeding it up). A complete electron microscopy image volume of the larval CNS was produced by Richard D. Fetter and the Fly EM Project Team at HHMI Janelia Farm, and consists of about 5,000 serial sections of 50-nm thickness, imaged at 3.8x3.8 nanometers per pixel. Albert Cardona assembled the resulting several hundred thousand image tiles into a coherent volume using the software TrakEM2, powered by the powerful image registration algorithms developed and implemented by Stephan Saalfeld (see publication in Nature Methods). International collaborators are trained in our lab at Janelia during a visit spanning one to several months, and thereafter access the EM volume of the larval CNS and reconstruct its neurons and synapses online via the web browser, using the software CATMAID. Participating labs: James D. Truman, Marta Zlatic, Akinao Nose, Michael Pankratz, Simon Sprecher, Ping Shen, Aravi Samuel, Matthias Landgraf, Chris Doe, Matthieu Louis, Andreas Thum, Bertram Gerber, Volker Hartenstein, David Stern, Andreas Thum, Enrique Martin-Blanco, Wesley Grueber, Christian Klämbt, Davi Bock. Zlatic lab: behavior on the basis of known circuitry. Truman lab: neuroanatomy of single neurons and identification of single-neuron class GAL4 genetic driver lines. 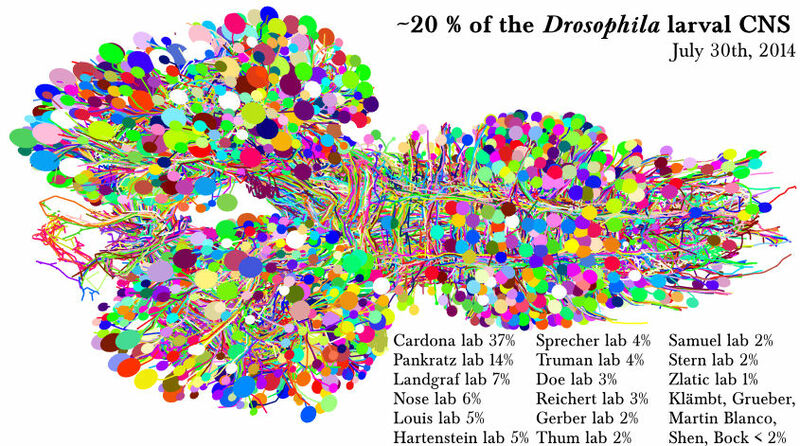 Richard D. Fetter: generation of EM volumes of Drosophila larval neuropils. Hess lab: imaging of EM volumes of Drosophila larva. Cook lab: novel methods for automatic and semi-automatic reconstruction of neuronal arbors from anisotropic EM volumes. Akinao Nose, Chris Q. Doe, Matthias Landgraf, Stefan Pulver and Ellie Heckscher on premotor circuit structure and function. Michael Pankratz on neural circuits for sensing the internal metabolic state and for feeding. Simon Sprecher on visual circuits. Volker Hartenstein, Matthieu Louis, Aravi Samuel, Andreas Thum, Wesly Grueber, Bertram Gerber, Greg Jefferis, Liria Masuda-Nakagawa, Lynne Oland and Leslie Tolbert, Christian Klämbt on mapping the circuits of multiple areas of the fly larval central nervous system. 2008-2011: Cardona lab at the Institute of Neuroinformatics. Last updated: 2016-07-05 23:26 New York time. Copyright Albert Cardona.